Many people think of Gran Fondo events, as touristic non competitive events. Well I can guarantee you, that here in Italy, that’s far from the case. Unlike the UK, where you apply for a racing license, and are given a category, based on your ability, to participate in road races. Italy is totally different. Here we have a category called dilettante, this is for riders under 26, who aspire in making the professional ranks. Outside of this category, and once you reach 26 years of age, the only form of racing is Gran Fondo. Gran Fondo event’s, are on every weekend all over the country. They are all mass start, but are gridded like running marathons, with Ex pro’s and Elites at the front, followed my top level club riders, and then amateur fun riders. Events average a minimum of 800 participants, for a regional race, to 12000, for the Prestige series, International events, like the Dolomites, Nove colli and Sportful. As this is the only form of bike racing available, outside of dilettante and Pro, the level at the front, is extremely high. As with all forms of sport, there is also a huge financial interest. The level changed drastically back in 2005 when Ex pro, and 3rd place Tour de France finisher, Raimondas Rumsas, started competing in GF events as a full time job. Raimondas started a trend, which was soon followed with other teams searching for ex pro’s, looking to continue racing their bikes on a full time basis. One of most notable facts in GF racing is the very high level of equipment. Top teams usually concentrate on 2-4 main riders, meaning bike manufactures can afford to supply teams with their flagship bikes. Unlike many smaller pro teams who have to supply 50 plus. The thousands of club riders are always interested in what equipment the top teams are using, and we all know Italians do like a nice bit of kit. This year Planet X are official bike sponsor to team VVF-PLANET X, from Genova. The team has a mix of riders, covering long course, short course and the womens category. And they are competing in a full calendar of events across the country. There is a big difference between the early season events, which are generally a little shorter, around 130-140km and slightly easier with around 1500-2000 meters of climbing. Compared to the big events from May onwards, which cover as much as 220km and 5000 meters of climbing. With such a variety of terrain and courses, the team chose 2 different models of PLANET X bikes, to best suit all conditions. “I actually received my Mondo, at the end of last season, so I have had plenty of time to give it a good running. This frame is something special, I have ridden many brands of bike over the years, including all the most popular, but the mondo stands out as the best yet. Firstly the frame is 100% hand made, by skilled craftsmen in Italy. You can feel the difference the first time you take it out. Hand made frames, have no access resin in unnecessary places, unlike moncoque frames, made from a mold. And the carbon tubes can be bonded and wrapped to meet the needs of each individual rider. The mondo has been built to meet the needs of any pro rider. It is extremely light, but stiff in all the right places. The oversized down tube and BB386 bottom bracket shell give great acceleration, bonded to the superbly made, box shape, chain stays. It has a fairly long top tube, compared to most bikes, and this was a key factor for me. I’m not the world’s best descender and this added length, combined with the tapered head tube and fork stearer, give you total control and confidence on the descents and corners. As always, the SRAM red group set is a faultless choice, in both breaking and gear changing quality. The FSA BB386 bottom bracket shell and K-FORCE chainset certainly work well too, the crank arms are so much closer to the bottom bracket shell, so you don’t lose any power on your pedal stroke. 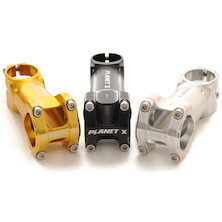 Planet X Handle bar and stem, are perfect proof that you don’t have to pay hundreds of pounds for quality items. 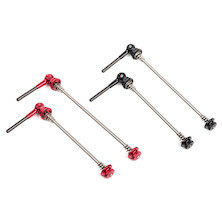 The CNC stem is superbly made, very light and stiff, and a much safer bet than carbon. The compact bars are a great shape, especially for small hands, and allow perfect lever positioning. I have been using both the Pro carbon 50 wheel set and the carbon 20, hand built wheels. As a technical opinion, I can say that the N2A proved to be an excellent and complete bike for Gran Fondo events, as it combines the lightness of carbon with the rigidity, which makes this model one of the best frames evaluated by our athletes. Very responsive under sress and in the sprints, and stiff on the descents, this allows our riders to find the best lines when cornering. As for the Mondo, I can personally express a professional opinion as I have tried this bike on a number of occasions. Frankly I think it's the best bike I've ridden in my career, extremely light, yet manages to stay so stiff. It’s almost difficult to believe how well it rides, especially in the GF events, which as you know, races are built on rapid ascents and technical descents. The Mondo, definitely makes the job of the rider much easier. It really is a true race bike, and allows those who use it to have a perfect balance between comfort, and a very advanced aerodynamic position. This helps to save precious energy on the flats, whilst being a punchy and responsive bike uphill. It also allows you to tackle the downhill’s with extreme safety for the fact that it does not flex at the front, even in the most demanding corners. You can call it a "pleasant surprise" my discovery of the British brand Planet X, the official sponsor of the team VVF – Planet x for the year 2013. First of all, it was very simple and convenient to select the right size of frame, even for me who is definitely not very practical in the field of sizing and positioning. Secondly, I cannot praise enough the N2A’s geometry. From the first moment that are sat on the bike I felt comfortable. Quick and precise uphill and downhill, very responsive in its handling. Its not always easy for a woman to find correct size and fitting with a bike, especially without loosing the quality of handling. I am also very fond of the 52mm carbon clinchers. With this wheel set, I feel at ease in all conditions. The aluminum braking surface is perfect in both wet and dry, and they also have the practicality of clincher tyres, which can be changed easily for different conditions, and after puncturing. Already in training I realized the potential of the bike, but with the beginning of the race season I was able to test it in a comprehensive manner, even in the wet. The season of races this year has started well enough, with three second places, but I’m definitely not yet at the top of my form. Firstly because of some small physical ailments, and because I want to enter my best shape later in the season. It is still important for me to bring home a better result next Sunday in the GF Pomarance and then get to the heart of the season in May. I cannot hide, however, that my goal this year is the Marathon of the Dolomites where I want to compete for the first time in the long route. I know it will not be easy just because I only know the 110 km short course, in fact I raced in the years 2004, 2005, 2008, 2009 and 2010 (bringing home three first places, a second and a third place overall) and I know that already this race is very challenging. Personally being a climber I chose the Mondo frame, with Sram Red group and Planet X carbon wheels for its impressive light weight of 6 ,4 kg . Although very light, its also a very stiff bike. Quick and reactive, but at the same time comfortable. My main goals for this year are the Granducato of Tuscany series of races. But unfortunately I had an accident last month so I had to miss the first round, and now it’s a big test to recover lost points for the overall classification. Until now I've ridden three short course events, with top 15 overall in all events, and a 1st, 2nd and 3rd place in my age group category. I have also been a key team player, helping out our short course team leader Enrico Saccomani. My first impressions of the N2A were very good; With continuous riding I was surprised and impressed the extreme comfort of the N2A despite the high level of rigidity, this allows you to have a great reaction to the steep violent climbs , and good handling on the technical descents. As a small rider, its often difficult finding a good fitting bike. I had a professional retul fit on the bike, and the result was my best position so far, with a nice amount of seat post showing, which I normally find difficult. The first races were very challenging because of my general condition. I work for the military and with long work days, training time is a bit limited until the summer months. Anyway all these early races are very helpful in building my base form in order to concentrate my peak physical condition in the coming months. My goals are to be competetivefor the big International level races, like the, Nove Colli, GF Sportful and the Marathon of the Dolomites. Last year I was 2nd behind Jamie in the Sportful, and 4th in the Dolomites.